Keywording isn’t fun. I have yet to meet a photographer who enjoys this exercise but where people do agree is that keywording is essential, especially if you have a sizable collection of images. Keywording can be incredibly time consuming and that’s why software companies such as Adobe have invested lots of effort into making it faster and easier. It’s really to your benefit to learn how to get the best out of the tools they have created. Read on and I will explain how. If you don’t plan your keywording strategy in advance you can quickly get yourself into a mess and find what should be a simple task grows out of all recognition. 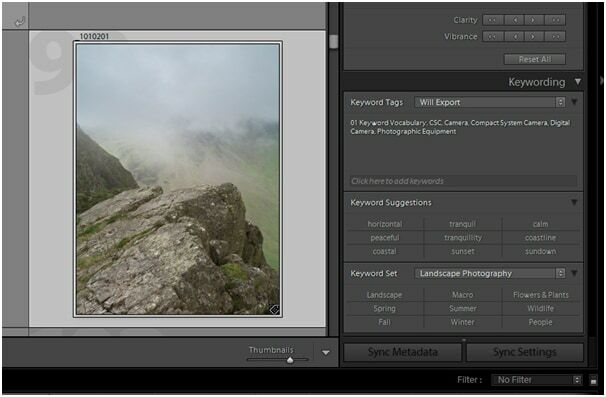 Create a metadata template to apply core information to your images e.g. contact details, copyright notice etc on import to Lightroom. This is something I covered in my Lightroom Primer article previously. Let’s look at points 2 and 3 in a little more detail. A keyword vocabulary is simply a collection of keywords that you can select from in order to apply these to images. Building and maintaining your keyword vocabulary can seem difficult and time consuming at first but over time the demand reduces and you will start to see the benefit from this investment. GX1 – Micro 4/3 – Compact System Camera – Digital Camera – Camera – Photography Equipment. 5D MKII – Full Frame Sensor – SLR - Digital Camera – Camera – Photographic Equipment. These hierarchies can also be placed into a diagram as follows. An alternative to producing the hierarchy as a diagram is to use a spreadsheet such as the example below where each column in the spreadsheet becomes a new level in the hierarchy. The advantage of this approach is that you can easily create a large vocabulary as well as check all the spellings. When you do this you might find that you have other classifications you want to make e.g. 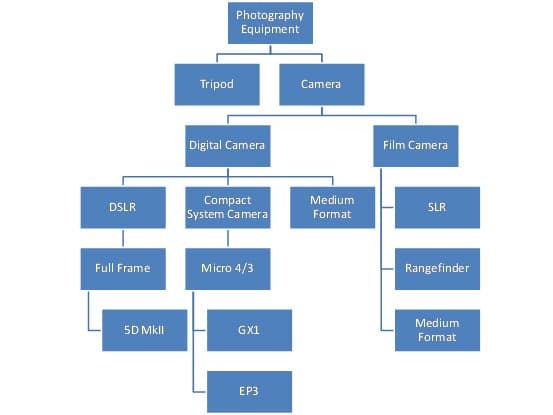 Canon, Nikon and Panasonic etc could be included. These are decisions you need to take in order to create a clear hierarchy that you understand. I would however stress that you don’t need to cover every classification and it’s often best to keep things simple. A further aspect of the hierarchy is that there might be multiple terms used to describe the same thing. For example CSC and Compact System Camera are two terms that define the same category. Where you find this is the case you should make a list of such words. Finally consider the characteristics of items in the hierarchy, for example the GX1 is made by Panasonic, is a Lumix and has 16Mpixels. Another completely different example might be a Dog where a dog has 4 legs, a tail and barks. These characteristics will be used to enhance our keyword vocabulary later. In the keyword panel on the right, Right Click on the keyword heading and select “Create Keyword Tag...” from the popup menu as shown in the screen shot below. 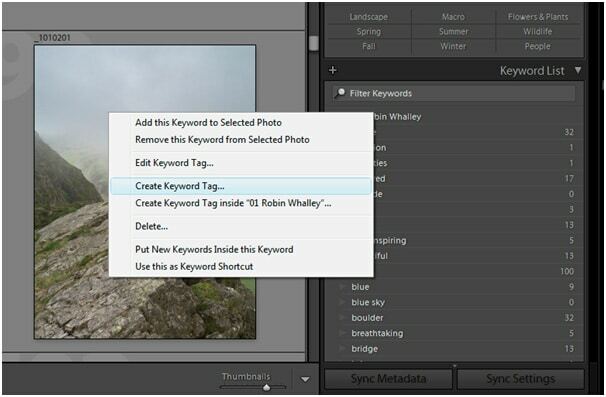 Lightroom will now display the “Create Keyword Tag” dialog box as shown below. In the “Keyword name” field enter the keyword you want to create. In this case enter “01 Keyword Vocabulary”. This keyword will act as a container to hold all your other keywords. The reason I suggest starting the name with 01 is so that it appears at the top of your keywords list. Once you have entered the new keyword click “Create” and you will see the new keyword added to the Keywords panel on the right of the screen. 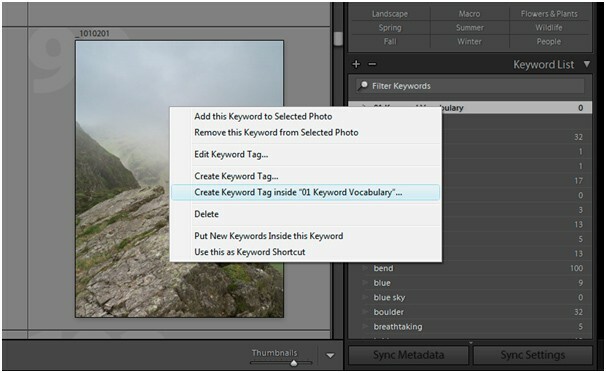 One of the advantages of Lightroom over many other keywording tools is that it supports keyword hierarchies, just like you produced earlier. 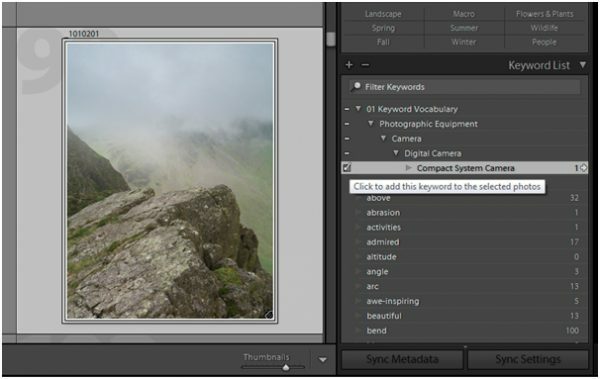 You can therefore add keywords inside other keywords which also has benefits when you come to apply keywords to images. To create a keyword inside another simply right click on the keyword you want to be at the top of the hierarchy. 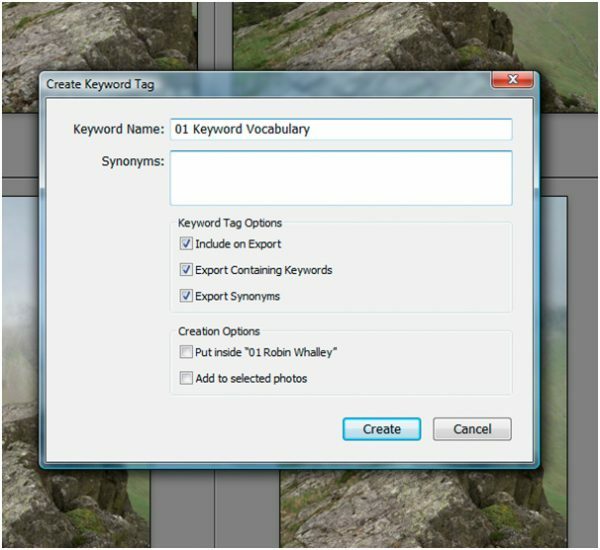 From the popup menu select the “Create keyword tag inside 01 Keyword Vocabulary” option as shown below. 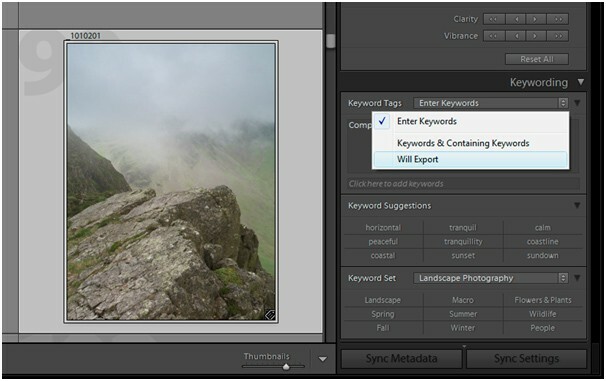 One of the “features” of Lightroom is that it adds new keywords where images with existing keywords are imported if the keyword doesn’t exist in your keywords. I find it best to move these into my hierarchy so as to keep building and improving it. All you need to do is drag and drop the new keywords into your hierarch and then create any synonyms as described above. Once your hiearchy is complete its time to start adding keywords to images. I find the easiest way to do this is to select the images you want to work on in the Library module and then click on the keywords you want to apply in the keyword panel. When you move the mouse over the keyword you want to apply you will see a little box appear on the left of the keyword and you can click on this to tick the keyword as shown in the screenshot below. When you select a keyword further down the hierarchy Lightroom will also add all the keywords above it in the hierarchy. 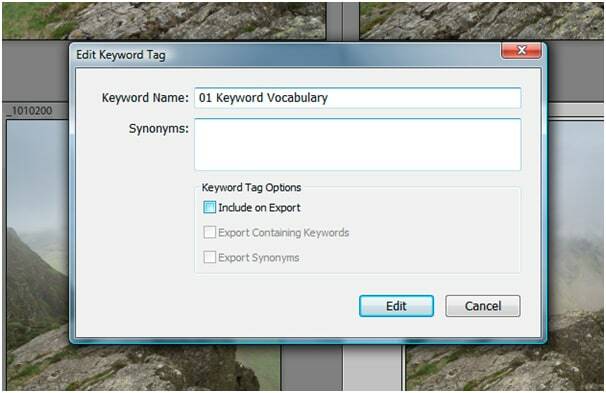 Additionally it will add any Synonym keywords that appear in the hierarchy. This makes it very fast to apply lots of relevant keywords to your images. You might now be wondering how you can see exactly which keywords are added to the image rather than viewing just the hierarchy. This can be done quite easily a little further up in the keyword panel in the “Keyword Tags” section. By default this is set to “Enter Keywords” but suggest you change this by clicking on it and selecting the “Will Export” option as shown below. This will then show the list of keywords that will be applied to the image when exported to an image file. The other reason I would avoid the “Enter Keywords” option is that it doesn’t lend itself to building keyword hierarchies. 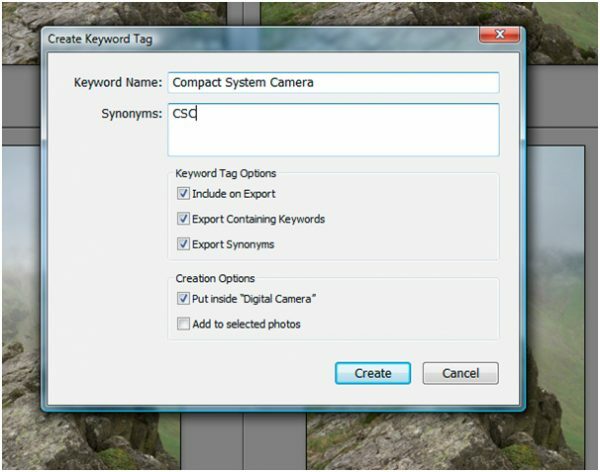 Below is the screenshot showing the keywords that will be applied to the image I have selected. You will notice that my container keyword “01 Keyword Vocabulary” is being exported but actually I don’t want this as it doesn’t mean anything to anyone other than me and no one is going to do a picture search using this term. Fortunately Lightroom provides an easy fix for this. Simply double click on the keyword in the Hierarchy that you don’t want to be added to your file. This causes the Edit Keyword Tag dialog to be displayed. In the dialog uncheck the “Include on Export” option and the problem is resolved. It’s important to recognise that your keyword vocabulary will continue to build and grow over time as you keyword more images and the number of missing keywords will reduce. Your keyword library can become incredibly valuable especially if you are keywording images for a stock library. Take steps early on to manage and control this and it will make your life a lot easier later on.